We can print a lot of things here in Kaizen and when someone comes to us with a project a little out of the ordinary, weâ€™ll certainly do our very best to accommodate. So when the Community Housing Cymru came to us a few weeks back looking over 100 foamex boards shaped like houses, we were glad to assist. Truth be told this is a project we had already completed for the Northern Ireland Federation of Housing Associations over the past year and so we have become dab hands at creating weird and wonderful promotional boards for a variety of indoor and outdoor uses. 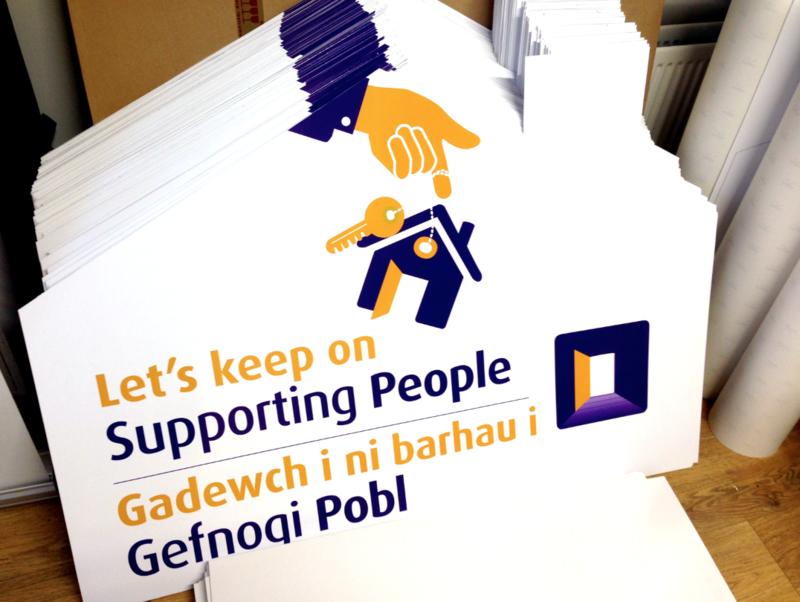 Alongside the foamex panels, we supplied a number of roller banners for the Community Housing Cymru team to use within their offices and at events. The project itself is titled â€œSupporting Peopleâ€ and is a campaign that seeks to secure the protection of vulnerable people by providing a dedicated housing support programme. Essentially it is a coalition of charities and voluntary organisations that provides vital support to help more than 26,000 people in Northern Ireland live as independently as possible. A very notable and worthwhile cause I think youâ€™ll agree. If you want to make a donation or find out more information, you can visit the NI website http://www.chni.org.uk/spcampaign.html or if you are in Wales http://www.cymorthcymru.org.uk.